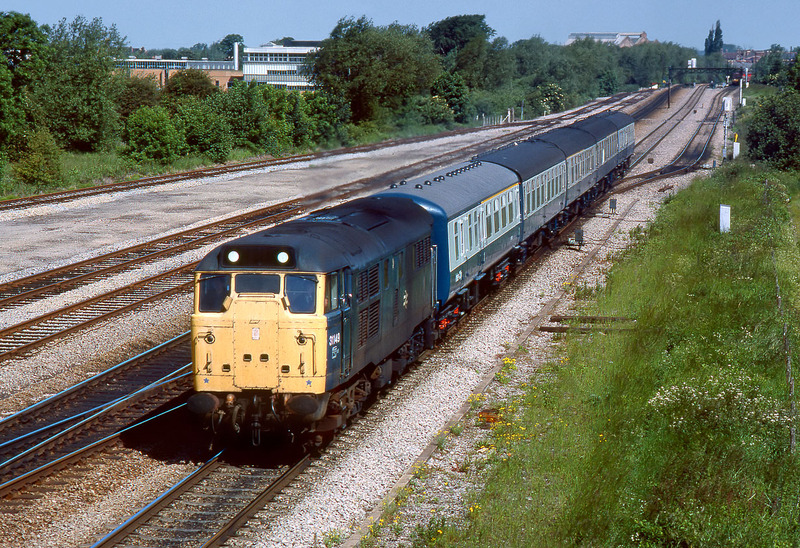 31149 passes Hinksey Yard on 14 June 1983 with what I presume is the Tuesday's only 5V91 07:55 Tyseley Sidings to Swindon Works ECS. There were occasional movements of refurbished stock from Wolverton via the Bicester line in the 1980s, which would certainly explain the ex-works Mk2 at the front of the train. However, the Summer 1983 working timetable lists 5V91 as passing Oxford within half an hour of this working, so it all seems to fit. Unfortunately I have been unable to find any other picture of 5V91 to corroborate it!